Definition at line 38 of file SmallVector.h. Definition at line 44 of file SmallVector.h. Definition at line 53 of file SmallVector.h. Referenced by llvm::SmallVectorImpl< std::pair< llvm::RelocationValueRef, llvm::RelocationEntry > >::append(), llvm::SmallVectorImpl< std::pair< llvm::RelocationValueRef, llvm::RelocationEntry > >::assign(), llvm::SmallVectorTemplateCommon< T >::capacity_in_bytes(), llvm::SmallVectorImpl< std::pair< llvm::RelocationValueRef, llvm::RelocationEntry > >::emplace_back(), llvm::SmallVectorTemplateBase< T >::grow(), llvm::SmallVectorImpl< std::pair< llvm::RelocationValueRef, llvm::RelocationEntry > >::insert(), llvm::SmallVectorImpl< std::pair< llvm::RelocationValueRef, llvm::RelocationEntry > >::operator=(), llvm::SmallVectorTemplateBase< T >::push_back(), llvm::SmallVectorTemplateBase< T, true >::push_back(), llvm::SmallVectorImpl< std::pair< llvm::RelocationValueRef, llvm::RelocationEntry > >::reserve(), llvm::SmallVectorImpl< std::pair< llvm::RelocationValueRef, llvm::RelocationEntry > >::resize(), set_size(), and llvm::SmallVectorImpl< std::pair< llvm::RelocationValueRef, llvm::RelocationEntry > >::swap(). Definition at line 55 of file SmallVector.h. Referenced by llvm::PMDataManager::add(), AddAliasScopeMetadata(), addAllGlobalValueUsers(), addBlockAndPredsToSet(), llvm::SchedDFSImpl::addConnection(), llvm::InstCombineWorklist::AddInitialGroup(), llvm::pdb::PDBFileBuilder::addInjectedSource(), llvm::RegsForValue::AddInlineAsmOperands(), llvm::DbgVariable::addMMIEntry(), addNonNullAttrs(), addRange(), AddReachableCodeToWorklist(), llvm::MachineInstr::addRegisterDead(), llvm::MachineInstr::addRegisterKilled(), llvm::ARMFrameLowering::adjustForSegmentedStacks(), AdjustStackOffset(), advanceToNextLeafType(), llvm::LegalizeRuleSet::aliasTo(), llvm::AllocationOrder::AllocationOrder(), allUsersAreInFunction(), llvm::LoopInfoBase< BasicBlock, Loop >::analyze(), llvm::analyzeArguments(), llvm::ARCInstrInfo::analyzeBranch(), llvm::MSP430InstrInfo::analyzeBranch(), llvm::LanaiInstrInfo::analyzeBranch(), llvm::AVRInstrInfo::analyzeBranch(), llvm::ARMBaseInstrInfo::analyzeBranch(), llvm::SystemZInstrInfo::analyzeBranch(), llvm::SIInstrInfo::analyzeBranch(), analyzeLoopUnrollCost(), AnalyzeReturnValues(), llvm::sys::path::append(), appendEndToFunction(), llvm::internal::appendLoopsToWorklist(), appendLoopsToWorklist(), appendToUsedList(), llvm::A57ChainingConstraint::apply(), llvm::MemorySSAUpdater::applyInsertUpdates(), llvm::DomTreeBuilder::SemiNCAInfo< DomTreeT >::ApplyNextUpdate(), llvm::MemorySSAUpdater::applyUpdates(), AssignProtectedObjSet(), llvm::ImutAVLTreeGenericIterator< ImutInfo >::atEnd(), llvm::SmallVectorTemplateCommon< T >::back(), BatchCommitValueTo(), bothUsedInPHI(), llvm::SSAUpdaterImpl< UpdaterT >::BuildBlockList(), buildClonedLoops(), buildGEP(), buildMultiplyTree(), CalcNodeSethiUllmanNumber(), llvm::IDFCalculator< NodeTy, IsPostDom >::calculate(), llvm::calculateClrEHStateNumbers(), callingConvSupported(), canonicalizePHIOperands(), canPaddingBeAccessed(), llvm::TailDuplicator::canTailDuplicate(), canTRE(), canUseReferenceType(), castRequiresQueuePtr(), CC_Lanai32_VarArg(), CC_RISCV(), llvm::CC_SystemZ_I128Indirect(), CC_X86_32_MCUInReg(), llvm::AArch64TargetLowering::CCAssignFnForReturn(), llvm::ARMTargetLowering::CCAssignFnForReturn(), llvm::SSAUpdaterImpl< UpdaterT >::CheckIfPHIMatches(), checkScale(), llvm::TypeFinder::clear(), llvm::ArrayRecycler< llvm::MachineOperand >::clear(), clearAssumptionsOfUsers(), cloneLoopNest(), collectCastsToIgnore(), collectEHScopeMembers(), collectHomogenousInstGraphLoopInvariants(), llvm::LoopVectorizationCostModel::collectInstsToScalarize(), collectTransitivePredecessors(), llvm::colorEHFunclets(), combineRedundantDWordShuffle(), combineX86ShufflesRecursively(), llvm::FunctionComparator::compare(), llvm::ScalarEvolution::computeAccessFunctions(), computeBlocksDominatingExits(), llvm::computeDeadSymbols(), llvm::MCCodePaddingPolicy::computeFirstWindowPenaltyWeight(), ComputeImportForModule(), llvm::computeMinimumValueSizes(), llvm::slpvectorizer::BoUpSLP::computeMinimumValueSizes(), ComputePostOrders(), llvm::MCCodePaddingPolicy::computeRangePenaltyWeight(), computeUnlikelySuccessors(), computeUnsignedMinMaxValuesFromKnownBits(), llvm::JumpThreadingPass::ComputeValueKnownInPredecessorsImpl(), llvm::ConstantAggrKeyType< ConstantClass >::ConstantAggrKeyType(), llvm::ConstantExprKeyType::ConstantExprKeyType(), llvm::ConstantFoldGetElementPtr(), llvm::ConstantFoldLoadFromConstPtr(), ConstHasGlobalValuePredicate(), llvm::LiveRangeCalc::constructMainRangeFromSubranges(), ContainsReg(), ConvertToSInt(), llvm::convertUTF8ToUTF16String(), CrashHandler(), createAndInstr(), llvm::createBlockExtractorPass(), createCallInst(), llvm::createDeadArgHackingPass(), llvm::createDwarfEHPass(), llvm::createObjCARCOptPass(), createPackShuffleMask(), createRdxShuffleMask(), llvm::DwarfCompileUnit::createScopeChildrenDIE(), createSwiftErrorEntriesInEntryBlock(), llvm::createUnpackShuffleMask(), llvm::createX86FixupBWInsts(), deleteDeadInstruction(), DeleteTriviallyDeadInstructions(), llvm::ScalarEvolution::delinearize(), despeculateCountZeros(), llvm::ARMFrameLowering::determineCalleeSaves(), llvm::HexagonFrameLowering::determineCalleeSaves(), determinePointerReadAttrs(), DoInitialMatch(), llvm::GVNExpression::Expression::dump(), dumpMachineInstrRangeWithSlotIndex(), llvm::ScheduleDAGSDNodes::dumpNode(), dumpScopes(), llvm::PMDataManager::dumpUsedSet(), llvm::JumpThreadingPass::DuplicateCondBranchOnPHIIntoPred(), dwarfCCToCodeView(), llvm::SMSchedule::earliestCycleInChain(), llvm::LiveRangeEdit::eliminateDeadDefs(), eliminateDeadSwitchCases(), llvm::EmitAnyX86InstComments(), llvm::InstrEmitter::EmitDbgLabel(), llvm::ConstantPool::emitEntries(), llvm::PPCFrameLowering::emitEpilogue(), llvm::ARMAsmPrinter::EmitJumpTableTBInst(), llvm::WebAssemblyTargetWasmStreamer::emitLocal(), llvm::WebAssemblyAsmPrinter::EmitProducerInfo(), llvm::PPCFrameLowering::emitPrologue(), llvm::AsmPrinter::emitRemarksSection(), llvm::ScheduleDAGSDNodes::EmitSchedule(), llvm::DWARFDebugMacro::empty(), llvm::ConstantPool::empty(), llvm::SmallSet< unsigned, 16 >::empty(), llvm::SparseSet< unsigned, llvm::VirtReg2IndexFunctor >::empty(), llvm::SDDbgInfo::empty(), llvm::LiveRange::empty(), llvm::MDAttachmentMap::empty(), llvm::MDGlobalAttachmentMap::empty(), llvm::codeview::CodeViewRecordIO::endRecord(), ensurePromotedGV(), EnsureStackAlignment(), eraseDeadBBsAndChildren(), llvm::DomTreeBuilder::SemiNCAInfo< DomTreeT >::eval(), llvm::VPBasicBlock::execute(), llvm::InstructionSelector::executeMatchTable(), explicifyGuards(), llvm::DIBuilder::finalize(), llvm::ScalarEvolution::findArrayDimensions(), findBasePointer(), llvm::rdf::FuncNode::findBlock(), llvm::objcarc::FindDependencies(), llvm::findDevirtualizableCallsForTypeTest(), llvm::FindFunctionBackedges(), findHoistingInsertPosAndDeps(), findInitTrampoline(), findMatchingInlineAsmOperand(), FindMostPopularDest(), findRefEdges(), findSingleRegDef(), findSRegBaseAndIndex(), firstRealType(), FitWeights(), FixTail(), llvm::ScalarEvolution::forgetLoop(), llvm::ScalarEvolution::forgetValue(), llvm::formDedicatedExitBlocks(), llvm::formLCSSAForInstructions(), llvm::SmallVectorTemplateCommon< T >::front(), llvm::FunctionComparator::functionHash(), llvm::StackSafetyInfo::FunctionInfo::FunctionInfo(), FunctionNumber(), generateEquivalentSub(), llvm::ScalarEvolution::getAddExpr(), llvm::rdf::Liveness::getAllReachingDefsRec(), llvm::WebAssemblyExceptionInfo::getAnalysisUsage(), llvm::RegBankSelect::getAnalysisUsage(), getBaseType(), getCastsForInductionPHI(), getCombinerObjective(), GetConstantInt(), llvm::getConstantVRegValWithLookThrough(), getCoroBeginPredBlocks(), llvm::MCStreamer::getCurrentSection(), getDebugLocValue(), llvm::DominatorTreeBase< BasicBlock, false >::getDescendants(), llvm::DomTreeNodeBase< VPBlockBase >::getDFSNumOut(), llvm::DWARFContext::getDWOContext(), llvm::getEHScopeMembership(), llvm::MachineBasicBlock::getFallThrough(), getFallThroughMBB(), getFPReg(), llvm::safestack::StackLayout::getFrameSize(), getFunctionNameAndStartLineForAddress(), llvm::ScheduleDAGSDNodes::getGraphNodeLabel(), llvm::DWARFUnit::getInlinedChainForAddress(), getInnermostLoopFor(), getInsertVecEltOpInfo(), llvm::MemoryDependenceResults::getInvariantGroupPointerDependency(), llvm::HexagonInstrInfo::getInvertedPredSense(), getLAScore(), getLayoutSuccessorProbThreshold(), llvm::getLibcallSignature(), llvm::DWARFContext::getLineTableForUnit(), llvm::LoopInfoBase< BasicBlock, Loop >::getLoopsInPreorder(), llvm::LoopInfoBase< BasicBlock, Loop >::getLoopsInReverseSiblingPreorder(), getMatchingEHPad(), llvm::SlotIndexes::getMBBFromIndex(), getMOVL(), llvm::ScalarEvolution::getMulExpr(), getNames(), llvm::MemoryDependenceResults::getNonLocalCallDependency(), getNotRelocatableInstructions(), getNumAllocatableRegsForConstraints(), getOffsetFromIndices(), llvm::LexicalScopes::getOrCreateAbstractScope(), GetPointerOperand(), getPrefixes(), llvm::MCStreamer::getPreviousSection(), getPTXCmpMode(), getRangeForAffineARHelper(), getRelevantOperands(), getSelectsInScope(), llvm::ScalarEvolution::getSMaxExpr(), getStartOrEndSlot(), getTargetConstantBitsFromNode(), llvm::ARCTargetLowering::getTargetNodeName(), getTargetShuffleMask(), llvm::slpvectorizer::BoUpSLP::getTreeCost(), llvm::Intrinsic::getType(), getTypePartition(), llvm::ScalarEvolution::getUMaxExpr(), llvm::ScalarEvolution::getUMinExpr(), llvm::ScalarEvolution::getUMinFromMismatchedTypes(), llvm::GetUnderlyingObjects(), getUnderlyingObjects(), llvm::getUnderlyingObjectsForCodeGen(), getUnwindDestToken(), getUnwindDestTokenHelper(), llvm::SSAUpdater::GetValueInMiddleOfBlock(), llvm::PhiValues::getValuesForPhi(), GetVBR(), llvm::slpvectorizer::BoUpSLP::getVectorElementSize(), llvm::ImutAVLTreeGenericIterator< ImutInfo >::getVisitState(), HandleMergeInputChains(), llvm::VPRecipeBuilder::handleReplication(), llvm::LiveVariables::HandleVirtRegDef(), llvm::LiveRange::hasAtLeastOneValue(), hasCallsInBlocksBetween(), llvm::DbgVariable::hasComplexAddress(), llvm::DomTreeBuilder::SemiNCAInfo< DomTreeT >::HasForwardSuccessors(), llvm::DbgVariable::hasFrameIndexExprs(), llvm::MCAsmParser::hasPendingError(), llvm::SDNode::hasPredecessorHelper(), hasRegisterDependency(), hasSameExtUse(), hasStoreUsersOnly(), hasVulnerableLoad(), haveEfficientBuildVectorPattern(), llvm::DebugHandlerBase::identifyScopeMarkers(), INITIALIZE_PASS(), llvm::DbgVariable::initializeDbgValue(), llvm::DbgVariable::initializeMMI(), llvm::InlineFunction(), llvm::SmallSet< unsigned, 16 >::insert(), llvm::VPBlockUtils::insertBlockAfter(), llvm::MemorySSAUpdater::insertDef(), insertDeleteInstructions(), llvm::LazyCallGraph::RefSCC::insertIncomingRefEdge(), insertPHI(), llvm::InsertPointAnalysis::InsertPointAnalysis(), llvm::DomTreeBuilder::SemiNCAInfo< DomTreeT >::InsertReachable(), insertSinCosCall(), llvm::VPBlockUtils::insertTwoBlocksAfter(), llvm::MipsAnalyzeImmediate::Inst::Inst(), llvm::PhiValues::invalidate(), llvm::MachineTraceMetrics::Ensemble::invalidate(), is_ns_word_char(), isACalleeSavedRegister(), isAllocSiteRemovable(), isAlwaysFoldable(), llvm::LazyCallGraph::SCC::isAncestorOf(), llvm::LazyCallGraph::RefSCC::isAncestorOf(), isBlockValidForExtraction(), isBroadcastShuffle(), llvm::AbstractCallSite::isCallbackCall(), llvm::AbstractCallSite::isCallee(), llvm::DomainValue::isCollapsed(), isCopyFeedingInvariantStore(), isDefInSubRange(), llvm::SITargetLowering::isEligibleForTailCallOptimization(), llvm::InstCombineWorklist::isEmpty(), isEphemeralValueOf(), isFullCopyOf(), isFuncOrArgAttr(), isImmValidForOpcode(), isKnownNonNullFromDominatingCondition(), isLeakCheckerRoot(), llvm::DwarfDebug::isLexicalScopeDIENull(), isLoadConditional(), isLocalCopy(), isMatchingOrAlias(), llvm::MCDwarfLineTableHeader::isMD5UsageConsistent(), isMinSize(), isNonEscapingGlobalNoAliasWithLoad(), IsNonLocalValue(), isObjectSizeLessThanOrEq(), isOnlyCopiedFromConstantGlobal(), isOnlyReachableViaThisEdge(), isOpcodeHandled(), isOperandKill(), llvm::isPotentiallyReachableFromMany(), isReInterleaveMask(), isSafeToMove(), isSafeToPromoteArgument(), isSafeToSpeculatePHIUsers(), isSimpleIVUser(), isSortedByValueNo(), IsStoredObjCPointer(), isSuccOrder(), isSupportedGuardInstruction(), isTargetConstant(), isTerminalReg(), llvm::LoopVectorizationLegality::isUniform(), isUniformlyReached(), llvm::object::WasmSectionOrderChecker::isValidSectionOrder(), IsValueFullyAvailableInBlock(), isVectorPromotionViable(), llvm::mca::InstrDesc::isZeroLatency(), llvm::SMSchedule::latestCycleInChain(), llvm::MCAsmLexer::Lex(), LinearizeExprTree(), llvm::coverage::CoverageMapping::load(), llvm::vfs::lookupInMemoryNode(), llvm::vfs::RedirectingFileSystem::lookupPath(), llvm::X86CallLowering::lowerCall(), llvm::ARMCallLowering::lowerCall(), llvm::AArch64CallLowering::lowerCall(), llvm::HexagonTargetLowering::LowerCall(), llvm::SITargetLowering::LowerCall(), llvm::SystemZTargetLowering::LowerCall(), llvm::NVPTXTargetLowering::LowerCall(), llvm::SparcTargetLowering::LowerCall_32(), llvm::SparcTargetLowering::LowerCall_64(), lowerCallResult(), LowerCallResult(), llvm::ARMCallLowering::lowerFormalArguments(), llvm::SITargetLowering::LowerFormalArguments(), llvm::SparcTargetLowering::LowerFormalArguments_64(), lowerGuardIntrinsic(), llvm::SITargetLowering::LowerReturn(), llvm::SystemZTargetLowering::LowerReturn(), llvm::NVPTXTargetLowering::LowerReturn(), LowerVASTART(), lowerWidenableCondition(), markAliveBlocks(), MarkBlocksLiveIn(), markTails(), llvm::FileCheckPattern::match(), MatchingStackOffset(), matchPair(), llvm::codeview::CodeViewRecordIO::maxFieldLength(), mayTailCallThisCC(), mayUseP9Setb(), mayUsePostIncMode(), memoryIsNotModifiedBetween(), MergeAliasResults(), mergeCleanupPad(), mergeOperations(), moveAndTeeForMultiUse(), llvm::object::ExportEntry::moveNext(), llvm::sys::path::native(), llvm::EscapeEnumerator::Next(), nextRealType(), llvm::mca::ExecuteStage::notifyReservedOrReleasedBuffers(), okayForPHIOfOps(), llvm::ImutAVLTreeGenericIterator< ImutInfo >::operator*(), llvm::ImutAVLTreeGenericIterator< ImutInfo >::operator++(), llvm::ImutAVLTreeGenericIterator< ImutInfo >::operator--(), AllocaSlices::partition_iterator::operator==(), llvm::BranchFolder::OptimizeFunction(), llvm::X86InstrInfo::optimizeLoadInstr(), llvm::MemorySSA::OptimizeUses::OptimizeUses(), llvm::X86FrameLowering::orderFrameObjects(), packCmovGroup(), parseCond(), ParseFunctionArgs(), llvm::MetadataLoader::MetadataLoaderImpl::parseMetadataAttachment(), parseOptionalLinkageAux(), Passv64i1ArgInRegs(), llvm::BasicAAResult::pointsToConstantMemory(), preassignSwiftErrorRegs(), PrepareCall(), PrepareTailCall(), llvm::DIExpression::prependOpcodes(), llvm::ValueEnumerator::print(), llvm::MachineDominatorTree::print(), llvm::WebAssemblyInstPrinter::printInst(), llvm::printLoop(), llvm::MCAsmParser::printPendingErrors(), printSyncScope(), llvm::AlignmentFromAssumptionsPass::processAssumption(), processCallSite(), processHeaderPhiOperands(), llvm::JumpThreadingPass::ProcessThreadableEdges(), promoteArguments(), llvm::promoteLoopAccessesToScalars(), propagateMetadata(), propagateSwiftErrorVRegs(), PushDefUseChildren(), pushDepHeight(), PushLoopPHIs(), llvm::BitstreamCursor::ReadBlockEnd(), readWideAPInt(), rebuildLoopAfterUnswitch(), recomputeLoopBlockSet(), llvm::InnerLoopVectorizer::recordVectorLoopValueForInductionCast(), llvm::RecursivelyDeleteTriviallyDeadInstructions(), RedzoneSizeForScale(), regOverlapsSet(), relocationViaAlloca(), llvm::sys::path::remove_dots(), llvm::safestack::StackColoring::removeAllMarkers(), RemoveDeadAddBetweenLEAAndJT(), llvm::LegacyInlinerBase::removeDeadFunctions(), llvm::SelectionDAG::RemoveDeadNodes(), llvm::PMDataManager::removeDeadPasses(), llvm::MemoryDependenceResults::removeInstruction(), llvm::LazyCallGraph::RefSCC::removeInternalRefEdge(), llvm::coro::replaceCoroFree(), replaceDevirtTrigger(), llvm::IntervalMapImpl::Path::replaceRoot(), replaceWithConstant(), reportMayClobberedLoad(), llvm::cl::ResetAllOptionOccurrences(), llvm::ARMFrameLowering::ResolveFrameIndexReference(), resolveRecordTypes(), RetagMask(), llvm::HexagonInstrInfo::reverseBranchCondition(), rewriteDebugUsers(), rewriteNonInstructionUses(), llvm::IRCEPass::run(), llvm::LoopPredicationPass::run(), llvm::AlwaysInlinerPass::run(), llvm::InlinerPass::run(), llvm::SpeculateAroundPHIsPass::run(), llvm::LoopUnrollPass::run(), llvm::WholeProgramDevirtPass::run(), llvm::DevirtSCCRepeatedPass< PassT >::run(), llvm::DomTreeBuilder::SemiNCAInfo< DomTreeT >::runDFS(), llvm::LoopVectorizePass::runImpl(), llvm::RewriteStatepointsForGC::runOnFunction(), llvm::SlotIndexes::runOnMachineFunction(), llvm::salvageDebugInfo(), salvageDebugInfoFromEmptyBlock(), scalarizeBinOpOfBuildVectors(), llvm::AMDGPUInstructionSelector::select(), llvm::SelectionDAGISel::SelectCodeCommon(), llvm::EngineBuilder::selectTarget(), llvm::LoopVectorizationCostModel::setCostBasedWideningDecision(), llvm::vfs::InMemoryFileSystem::setCurrentWorkingDirectory(), llvm::SUnit::setDepthDirty(), llvm::mca::WriteState::setEliminated(), llvm::VPRegionBlock::setEntry(), llvm::VPRegionBlock::setExit(), llvm::SUnit::setHeightDirty(), llvm::SUnit::setHeightToAtLeast(), llvm::DominatorTreeBase< BasicBlock, false >::setNewRoot(), llvm::VPBlockBase::setOneSuccessor(), llvm::VPBlockBase::setPredecessors(), llvm::VPBlockBase::setTwoSuccessors(), shouldKeepInEntry(), shouldRotateLoopExitingLatch(), shouldSplitOnPredicatedArgument(), shouldTransformMulToShiftsAddsSubs(), ShrinkLoadReplaceStoreWithStore(), simplifyCommonValuePhi(), llvm::simplifyLoopAfterUnroll(), simplifyLoopInst(), llvm::ImutAVLTreeGenericIterator< ImutInfo >::skipToParent(), AllocaSlices::SliceBuilder::SliceBuilder(), llvm::InstCombiner::SliceUpIllegalIntegerPHI(), llvm::SmallVector< llvm::cl::parser::OptionInfo, 8 >::SmallVector(), sortBlocks(), sortLocalVars(), SortNonLocalDepInfoCache(), llvm::SplitCriticalEdge(), llvm::SplitIndirectBrCriticalEdges(), llvm::SplitLandingPadPredecessors(), llvm::Function::stealArgumentListFrom(), llvm::StripDebugInfo(), StripSymbolNames(), llvm::MCStreamer::SubSection(), llvm::LazyCallGraph::RefSCC::switchInternalEdgeToCall(), llvm::LazyCallGraph::RefSCC::switchInternalEdgeToRef(), llvm::TailDuplicator::tailDuplicateAndUpdate(), llvm::JumpThreadingPass::ThreadEdge(), llvm::cl::TokenizeGNUCommandLine(), llvm::cl::TokenizeWindowsCommandLine(), llvm::detail::IEEEFloat::toString(), llvm::vfs::InMemoryFileSystem::toString(), toString(), transformToIndexedCompare(), llvm::LoopTraversal::traverse(), truncateIVUse(), tryBuildVectorShuffle(), llvm::LegalizationArtifactCombiner::tryCombineInstruction(), tryToElideArgumentCopy(), tryToSpeculatePHIs(), TurnSwitchRangeIntoICmp(), unifyReturnBlockSet(), unpackF64OnRV32DSoftABI(), unswitchTrivialSwitch(), llvm::DominatorTreeBase< BasicBlock, false >::updateDFSNumbers(), updateLiveness(), llvm::MachineBasicBlock::updateTerminator(), usedAsAddr(), llvm::IntervalMapImpl::Path::valid(), verifyCTRBranch(), llvm::LoopBase< BasicBlock, Loop >::verifyLoop(), llvm::mca::verifyOperands(), llvm::sroa::AllocaSliceRewriter::visit(), llvm::SCEVTraversal< SV >::visitAll(), visitDomSubTree(), llvm::InstCombiner::visitGetElementPtrInst(), llvm::InstCombiner::visitLandingPadInst(), visitPHIUsersAndDepsInPostOrder(), llvm::LazyCallGraph::visitReferences(), llvm::VPRegionBlock::VPRegionBlock(), wrapConstantAsMetadata(), llvm::writeArchive(), llvm::ArrayRecycler< llvm::MachineOperand >::~ArrayRecycler(), llvm::PrintIRInstrumentation::~PrintIRInstrumentation(), and llvm::SCEVExpander::~SCEVExpander(). Definition at line 42 of file SmallVector.cpp. References llvm::max(), llvm::report_bad_alloc_error(), llvm::safe_malloc(), llvm::safe_realloc(), and llvm::size(). Referenced by llvm::SmallVectorTemplateBase< T, true >::grow(), llvm::SmallVectorTemplateCommon< T >::grow_pod(), and SmallVectorBase(). Definition at line 66 of file SmallVector.h. References assert(), capacity(), and Size. Referenced by llvm::SmallVectorImpl< std::pair< llvm::RelocationValueRef, llvm::RelocationEntry > >::append(), llvm::SmallVectorImpl< std::pair< llvm::RelocationValueRef, llvm::RelocationEntry > >::assign(), llvm::zlib::compress(), llvm::SmallVectorImpl< std::pair< llvm::RelocationValueRef, llvm::RelocationEntry > >::emplace_back(), llvm::SmallVectorImpl< std::pair< llvm::RelocationValueRef, llvm::RelocationEntry > >::erase(), getMemoryBufferForStream(), llvm::SmallVectorImpl< std::pair< llvm::RelocationValueRef, llvm::RelocationEntry > >::insert(), llvm::SmallVectorImpl< std::pair< llvm::RelocationValueRef, llvm::RelocationEntry > >::operator=(), llvm::SmallVectorTemplateBase< T >::pop_back(), llvm::SmallVectorTemplateBase< T, true >::pop_back(), llvm::SmallVectorTemplateBase< T >::push_back(), llvm::SmallVectorTemplateBase< T, true >::push_back(), llvm::sys::path::remove_filename(), llvm::sys::path::replace_extension(), llvm::SmallVectorImpl< std::pair< llvm::RelocationValueRef, llvm::RelocationEntry > >::resize(), and llvm::SmallVectorImpl< std::pair< llvm::RelocationValueRef, llvm::RelocationEntry > >::swap(). Definition at line 52 of file SmallVector.h. Referenced by llvm::AArch64CallLowering::AArch64CallLowering(), llvm::InstCombineWorklist::Add(), AddAliasScopeMetadata(), llvm::AttributeList::addAttributes(), llvm::SSAUpdaterBulk::AddAvailableValue(), addData(), llvm::vfs::YAMLVFSWriter::addFileMapping(), llvm::RegsForValue::AddInlineAsmOperands(), llvm::cl::parser< const PassInfo *>::addLiteralOption(), addNegOperand(), addOptionalImmOperand(), llvm::AttributeList::addParamAttribute(), llvm::mca::RegisterFile::addRegisterRead(), addSegmentsWithValNo(), addStackMapLiveVars(), llvm::CodeViewContext::addToStringTable(), llvm::SSAUpdaterBulk::AddUse(), llvm::DebugLocEntry::addValues(), llvm::SSAUpdaterBulk::AddVariable(), adjustColumn(), adjustCostForPairing(), llvm::AggressiveAntiDepBreaker::AggressiveAntiDepBreaker(), llvm::StatepointLoweringState::allocateStackSlot(), llvm::AllocationOrder::AllocationOrder(), llvm::ForwardDominanceFrontierBase< BasicBlock >::analyze(), AnalyzeArguments(), llvm::analyzeArguments(), llvm::CCState::AnalyzeArgumentsSecondPass(), llvm::MSP430InstrInfo::analyzeBranch(), llvm::AVRInstrInfo::analyzeBranch(), llvm::SystemZInstrInfo::analyzeBranch(), llvm::X86InstrInfo::analyzeBranchPredicate(), llvm::SystemZCCState::AnalyzeCallOperands(), llvm::CCState::AnalyzeCallOperands(), llvm::CCState::AnalyzeCallResult(), llvm::SystemZCCState::AnalyzeFormalArguments(), llvm::CCState::AnalyzeFormalArguments(), llvm::AMDGPUTargetLowering::analyzeFormalArgumentsCompute(), llvm::CCState::AnalyzeReturn(), AnalyzeReturnValues(), llvm::analyzeStandardArguments(), AnyAliasLiveIn(), llvm::opt::ArgList::append(), llvm::sys::path::append(), llvm::SmallVectorImpl< std::pair< llvm::RelocationValueRef, llvm::RelocationEntry > >::append(), llvm::RegsForValue::append(), appendToUsedList(), llvm::DomTreeBuilder::SemiNCAInfo< DomTreeT >::ApplyUpdates(), areCallingConvEligibleForTCO_64SVR4(), assertBranchOrSelectConditionHoisted(), llvm::IntervalMapImpl::Path::atBegin(), llvm::ImutAVLTreeGenericIterator< ImutInfo >::atBeginning(), llvm::IntervalMapImpl::Path::atLastEntry(), llvm::DwarfCompileUnit::attachRangesOrLowHighPC(), BatchCommitValueTo(), branchMaxOffsets(), llvm::SSAUpdaterImpl< UpdaterT >::BuildBlockList(), buildFromShuffleMostly(), buildGEP(), llvm::VPlanSlp::buildGraph(), buildMultiplyTree(), BuildSubAggregate(), buildVector(), llvm::LoopVectorizationCostModel::calculateRegisterUsage(), llvm::DomTreeBuilder::CalculateWithUpdates(), callingConvSupported(), llvm::canConstantFoldCallTo(), canFoldInAddressingMode(), llvm::X86InstrInfo::canMakeTailCallConditional(), CanMergeParamLoadStoresStartingAt(), canProfitablyUnrollMultiExitLoop(), canSplitCallSite(), canUseSiblingCall(), canWidenShuffleElements(), CasesAreContiguous(), CC_AArch64_Custom_Block(), CC_ARM_AAPCS_Custom_Aggregate(), CC_Lanai32_VarArg(), CC_MipsO32_FP64(), CC_RISCV(), CC_X86_32_MCUInReg(), CC_X86_32_RegCall_Assign2Regs(), llvm::AArch64TargetLowering::CCAssignFnForReturn(), llvm::ARMTargetLowering::CCAssignFnForReturn(), chainLoadsAndStoresForMemcpy(), llvm::HexagonShuffler::check(), CheckBaseRegAndIndexRegAndScale(), CheckBundleSubtargets(), checkHVXPipes(), CheckMACMemory(), llvm::CCState::CheckReturn(), checkScale(), CHRScopeSorter(), CleanupPointerRootUsers(), llvm::ArrayRecycler< llvm::MachineOperand >::clear(), clobbersFlagRegisters(), llvm::CloneAndPruneIntoFromInst(), CloneLoop(), llvm::orc::cloneToNewContext(), llvm::collectChildrenInLoop(), collectInsertionElements(), collectMultiplyFactors(), CollectOpsToWiden(), llvm::collectPGOFuncNameStrings(), CombineBaseUpdate(), combineConcatVectorOfExtracts(), combineExtractWithShuffle(), combineOrCmpEqZeroToCtlzSrl(), combineTargetShuffle(), combineToConsecutiveLoads(), combineVectorShiftImm(), combineX86ShuffleChain(), combineX86ShufflesRecursively(), llvm::DominatorTreeBase< BasicBlock, false >::compare(), completeEphemeralValues(), llvm::IntEqClasses::compress(), llvm::ScalarEvolution::computeAccessFunctions(), llvm::EHStreamer::computeActionsTable(), llvm::ComputeASanStackFrameDescription(), llvm::ComputeASanStackFrameLayout(), computeBytesPoppedByCalleeForSRet(), llvm::WasmException::computeCallSiteTable(), llvm::EHStreamer::computeCallSiteTable(), llvm::X86TargetLowering::computeKnownBitsForTargetNode(), llvm::safestack::StackLayout::computeLayout(), llvm::EHStreamer::computePadMap(), llvm::FunctionLoweringInfo::ComputePHILiveOutRegInfo(), ComputePTXValueVTs(), llvm::computeSignatureVTs(), computeUnlikelySuccessors(), computeWeight(), llvm::concatenateVectors(), ConsecutiveRegisters(), llvm::ConstantFoldLoadFromConstPtr(), llvm::ConstantFoldSelectInstruction(), ConstructSSAForLoadSet(), llvm::LiveRange::containsOneValue(), containsSafePHI(), containsUndefs(), convertFPR32ToFPR64(), ConvertToSInt(), llvm::convertUTF8ToUTF16String(), createAndInstr(), llvm::createBlockExtractorPass(), createBSWAPShuffleMask(), llvm::createDeadArgHackingPass(), llvm::createDwarfEHPass(), llvm::createLICMPass(), createMMXBuildVector(), createRdxShuffleMask(), llvm::FunctionLoweringInfo::CreateRegs(), llvm::createStoreClusterDAGMutation(), llvm::sys::fs::createUniquePath(), llvm::LiveRange::createValueCopy(), createWrapper(), llvm::mca::ExecuteStage::cycleEnd(), llvm::mca::RegisterFile::cycleStart(), decodeLLVMAttributesForBitcode(), llvm::LegalizerInfo::decreaseToSmallerTypesAndIncreaseToSmallest(), llvm::DeleteDeadPHIs(), llvm::DependenceInfo::depends(), despeculateCountZeros(), llvm::ARMFrameLowering::determineCalleeSaves(), doesIgnoreDataTypeSuffix(), llvm::NVPTXAsmPrinter::doInitialization(), llvm::dwarf::CFIProgram::dump(), llvm::MCFragment::dump(), llvm::GVNExpression::Expression::dump(), llvm::slpvectorizer::BoUpSLP::VLOperands::dump(), dumpScopes(), llvm::PMDataManager::dumpUsedSet(), llvm::JumpThreadingPass::DuplicateCondBranchOnPHIIntoPred(), dwarfCCToCodeView(), eliminateDeadSwitchCases(), EmitAddTreeOfValues(), llvm::EmitAnyX86InstComments(), llvm::MCObjectStreamer::EmitBytes(), llvm::MCWinCOFFStreamer::EmitCOFFImgRel32(), llvm::MCWinCOFFStreamer::EmitCOFFSecRel32(), llvm::MCWinCOFFStreamer::EmitCOFFSectionIndex(), llvm::AsmPrinter::EmitConstantPool(), emitDarwinBCHeaderAndTrailer(), llvm::MCObjectStreamer::EmitDTPRel32Value(), llvm::MCObjectStreamer::EmitDTPRel64Value(), llvm::PPCFrameLowering::emitEpilogue(), llvm::MCObjectStreamer::emitFill(), llvm::MCObjectStreamer::EmitGPRel32Value(), llvm::MCObjectStreamer::EmitGPRel64Value(), llvm::MCWasmStreamer::EmitIdent(), llvm::MCWinCOFFStreamer::EmitInstToData(), llvm::WebAssemblyTargetWasmStreamer::emitLocal(), EmitNops(), emitNullTerminatedSymbolName(), llvm::XCoreFrameLowering::emitPrologue(), llvm::PPCFrameLowering::emitPrologue(), llvm::UnwindOpcodeAssembler::EmitRaw(), llvm::MCObjectStreamer::EmitRelocDirective(), llvm::ScheduleDAGSDNodes::EmitSchedule(), llvm::WebAssemblyAsmPrinter::EmitTargetFeatures(), llvm::MCObjectStreamer::EmitTPRel32Value(), llvm::MCObjectStreamer::EmitTPRel64Value(), llvm::MCObjectStreamer::EmitValueImpl(), llvm::SmallVectorImpl< std::pair< llvm::RelocationValueRef, llvm::RelocationEntry > >::emplace_back(), encodeBase64StringEntry(), encodeBitmaskPerm(), llvm::CodeViewContext::encodeDefRange(), llvm::CodeViewContext::encodeInlineLineTable(), llvm::MipsMCCodeEmitter::encodeInstruction(), llvm::codeview::ContinuationRecordBuilder::end(), llvm::SmallVectorTemplateCommon< T >::end(), EnsureStackAlignment(), llvm::LiveRangeEdit::eraseVirtReg(), llvm::InstructionSelector::executeMatchTable(), ExpandBVWithShuffles(), llvm::ARMTargetLowering::ExpandInlineAsm(), llvm::X86TargetLowering::ExpandInlineAsm(), llvm::TargetLowering::expandMUL(), ExpandResponseFile(), llvm::cl::ExpandResponseFiles(), ExtendUsesToFormExtLoad(), llvm::GISelWorkList< 8 >::finalize(), llvm::AccelTableBase::finalize(), llvm::finalizeBundle(), FindAllMemoryUses(), llvm::ScalarEvolution::findArrayDimensions(), findArrayDimensionsRec(), llvm::sampleprof::FunctionSamples::findFunctionSamples(), llvm::SparseMultiSet< VReg2SUnit, VirtReg2IndexFunctor >::findIndex(), findInitTrampoline(), FindInOperandList(), llvm::CodeExtractor::findInputsOutputs(), llvm::FindInsertedValue(), findMatchingInlineAsmOperand(), llvm::MachineInstr::findTiedOperandIdx(), findUncondBrI(), findUnwindDestinations(), llvm::MCAssembler::Finish(), llvm::SplitEditor::finish(), FitWeights(), llvm::InnerLoopVectorizer::fixNonInductionPHIs(), fixupVariableFloatArgs(), llvm::DomTreeUpdater::flush(), llvm::AMDGPULibCalls::fold(), foldBitcastedFPLogic(), llvm::FoldBranchToCommonDest(), llvm::SelectionDAG::FoldConstantArithmetic(), foldShuffleWithInsert(), for(), llvm::ScalarEvolution::forgetValue(), llvm::FmtAlign::format(), llvm::formLCSSAForInstructions(), ForwardSwitchConditionToPHI(), llvm::StackSafetyInfo::FunctionInfo::FunctionInfo(), FunctionNumber(), generateEquivalentSub(), llvm::ScalarEvolution::getAddExpr(), llvm::ScalarEvolution::getAddRecExpr(), GetAEABIUnwindPersonalityName(), llvm::IRTranslator::getAnalysisUsage(), getARClassRegisterMask(), getArrayElements(), getAttrFromCode(), getBranchInsertPoint(), GetBranchWeights(), llvm::AbstractCallSite::getCallArgOperandNoForCallee(), getCombinerObjective(), llvm::DebugLocStream::getComments(), getCompareCC(), getComparePred(), getCompareSourceReg(), llvm::SCEVUnionPredicate::getComplexity(), getConstantPart(), llvm::RegsForValue::getCopyToRegs(), getDepth(), llvm::LoopBase< BasicBlock, Loop >::getExitBlock(), llvm::LoopBase< BasicBlock, Loop >::getExitingBlock(), getFallThroughMBB(), getFauxShuffleMask(), getFPReg(), llvm::DIInliningInfo::getFrame(), getFrameIndexOperandNum(), llvm::RuntimeDyldELF::getGOTEntrySize(), llvm::sys::detail::getHostCPUNameForARM(), llvm::sys::detail::getHostCPUNameForS390x(), llvm::sys::getHostNumPhysicalCores(), llvm::NVPTXMachineFunctionInfo::getImageHandleSymbol(), llvm::NVPTXMachineFunctionInfo::getImageHandleSymbolIndex(), llvm::DWARFContext::getInliningInfoForAddress(), getInnermostLoopFor(), getInputChainForNode(), llvm::CCState::getInRegsParamInfo(), llvm::CCState::getInRegsParamsCount(), llvm::AArch64TTIImpl::getIntImmCost(), getIntOperandFromRegisterString(), getIntOperandsFromRegisterString(), getItaniumTypeName(), getLAScore(), llvm::RegisterClassInfo::getLastCalleeSavedAlias(), llvm::WinEHFuncInfo::getLastStateNumber(), getLayoutSuccessorProbThreshold(), llvm::DebugLocStream::getLists(), llvm::MachineFrameInfo::getLocalFrameObjectCount(), llvm::MachineFrameInfo::getLocalFrameObjectMap(), getMemcpyLoadsAndStores(), getMemmoveLoadsAndStores(), getMemoryBufferForStream(), getMemSetPatternValue(), getMemsetStores(), getMetadataTypeOrder(), llvm::MDNode::getMostGenericRange(), getMOVL(), llvm::ScalarEvolution::getMulExpr(), llvm::DIInliningInfo::getMutableFrame(), llvm::LiveRange::getNextValue(), llvm::DOTGraphTraits< BoUpSLP * >::getNodeAttributes(), getNoopInput(), getNumAllocatableRegsForConstraints(), llvm::AbstractCallSite::getNumArgOperands(), llvm::DIInliningInfo::getNumberOfFrames(), llvm::ExtractValueInst::getNumIndices(), llvm::InsertValueInst::getNumIndices(), llvm::RegBankSelect::RepairingPlacement::getNumInsertPoints(), llvm::DebugLocStream::getNumLists(), llvm::BitCodeAbbrev::getNumOperandInfos(), llvm::VPUser::getNumOperands(), llvm::MCInst::getNumOperands(), llvm::cl::parser< const PassInfo *>::getNumOptions(), llvm::VPBlockBase::getNumPredecessors(), llvm::mca::RegisterFile::getNumRegisterFiles(), llvm::VPBlockBase::getNumSuccessors(), llvm::VPValue::getNumUsers(), llvm::mca::WriteState::getNumUsers(), llvm::LiveRange::getNumValNums(), llvm::opt::Arg::getNumValues(), getOffsetFromIndices(), getOpEnabled(), getOpenCLAlignment(), llvm::VPUser::getOperand(), getOpRefinementSteps(), llvm::LessRecordRegister::RecordParts::getPart(), llvm::MachineTraceMetrics::Trace::getPHIDepth(), GetPointerOperand(), llvm::DomTreeUpdater::getPostDomTree(), getPrefixes(), llvm::MachineTraceMetrics::getProcResourceCycles(), llvm::MachineTraceMetrics::Ensemble::getProcResourceDepths(), llvm::MachineTraceMetrics::Ensemble::getProcResourceHeights(), llvm::NVPTXTargetLowering::getPrototype(), llvm::ReachingDefAnalysis::getReachingDef(), llvm::SystemZRegisterInfo::getRegAllocationHints(), getRegsUsedByPHIs(), getRetComponentType(), llvm::GetReturnInfo(), llvm::DominanceFrontierBase< BasicBlock, false >::getRoot(), llvm::DominatorTreeBase< BasicBlock, false >::getRoot(), getSelectsInScope(), llvm::GetShadowBytes(), getSignature(), llvm::DbgVariable::getSingleExpression(), llvm::VPBlockBase::getSinglePredecessor(), llvm::VPBlockBase::getSingleSuccessor(), llvm::ScalarEvolution::getSMaxExpr(), llvm::MipsCCState::getSpecialCallingConvForCallee(), llvm::DependenceInfo::getSplitIteration(), getStartOrEndSlot(), llvm::X86TargetMachine::getSubtargetImpl(), getSuccPad(), getTargetConstantBitsFromNode(), llvm::ARCTargetLowering::getTargetNodeName(), llvm::SystemZTargetLowering::getTargetNodeName(), llvm::SelectionDAG::getTokenFactor(), llvm::slpvectorizer::BoUpSLP::getTreeCost(), getTwoPredecessors(), llvm::ScalarEvolution::getUDivExpr(), llvm::ScalarEvolution::getUMaxExpr(), llvm::ScalarEvolution::getUMinExpr(), llvm::ScalarEvolution::getUMinFromMismatchedTypes(), getUnconditionalBrDisp(), getUnderlyingObjects(), llvm::LoopBase< BasicBlock, Loop >::getUniqueExitBlock(), llvm::ARMTTIImpl::getUnrollingPreferences(), llvm::SSAUpdaterImpl< UpdaterT >::GetValue(), llvm::yaml::ScalarNode::getValue(), llvm::SelectionDAGBuilder::getValueImpl(), llvm::MachineSSAUpdater::GetValueInMiddleOfBlock(), llvm::SSAUpdater::GetValueInMiddleOfBlock(), GetVBR(), greaterWithBias(), GroupByComplexity(), llvm::IntEqClasses::grow(), llvm::IndexedMap< unsigned, llvm::VirtReg2IndexFunctor >::grow(), llvm::guessSuccessors(), HandleMergeInputChains(), llvm::LiveVariables::HandleVirtRegDef(), llvm::DbgVariable::hasComplexAddress(), hasHugeExpression(), llvm::TargetInstrInfo::hasLoadFromStackSlot(), hasOnlySelectUsers(), llvm::DomTreeUpdater::hasPendingDomTreeUpdates(), llvm::DomTreeUpdater::hasPendingPostDomTreeUpdates(), llvm::VectorizerValueMap::hasScalarValue(), llvm::TargetInstrInfo::hasStoreToStackSlot(), hasValueBeenRAUWed(), llvm::SSAUpdaterBulk::HasValueForBlock(), llvm::VectorizerValueMap::hasVectorValue(), llvm::mca::MicroOpQueueStage::hasWorkToComplete(), llvm::IntervalMapImpl::Path::height(), llvm::HexagonMCShuffle(), llvm::detail::IEEEFloat::IEEEFloat(), llvm::IndexedMap< unsigned, llvm::VirtReg2IndexFunctor >::inBounds(), llvm::ValueEnumerator::incorporateFunction(), INITIALIZE_PASS(), llvm::InitLLVM::InitLLVM(), llvm::InlineFunction(), llvm::GISelWorkList< 8 >::insert(), llvm::SmallSet< unsigned, 16 >::insert(), llvm::SmallVectorImpl< std::pair< llvm::RelocationValueRef, llvm::RelocationEntry > >::insert(), llvm::insertDebugValuesForPHIs(), insertDeleteInstructions(), insertLifetimeMarkersSurroundingCall(), llvm::LiveIntervals::insertMBBInMaps(), llvm::SlotIndexes::insertMBBInMaps(), insertParsePoints(), InsertRootInitializers(), llvm::LazyCallGraph::RefSCC::insertTrivialCallEdge(), insertTrivialPHIs(), llvm::LazyCallGraph::RefSCC::insertTrivialRefEdge(), insertUndefLaneMask(), llvm::MipsAnalyzeImmediate::Inst::Inst(), instIsBreakpoint(), instrumentMaskedLoadOrStore(), isAlwaysFoldable(), isAssociative(), isCompareZero(), isCopyFeedingInvariantStore(), isDefInSubRange(), llvm::SparseSolver< LatticeKey, LatticeVal, KeyInfo >::isEdgeFeasible(), llvm::AArch64TargetLowering::isFPImmLegal(), isFunctionEntryBlock(), isImmValidForOpcode(), isInSymtab(), IsInterestingCmp(), llvm::LegalizerInfo::isLegal(), llvm::DwarfDebug::isLexicalScopeDIENull(), isLoadConditional(), llvm::ARMBaseInstrInfo::isLoadFromStackSlotPostFE(), isLoopPassName(), isMatchingOrAlias(), IsMemoryAssignmentError(), isMinSize(), isOpcodeHandled(), isOperandOf(), isOperator(), llvm::DomTreeBuilder::SemiNCAInfo< DomTreeT >::isPermutation(), isPointerValueDeadOnEntryToFunction(), isRegOrImmWithInputMods(), isReInterleaveMask(), IsRevOpcode(), IsSafeAndProfitableToMove(), isSafeToExecuteUnconditionally(), isSETCCorConvertedSETCC(), isShuffleExtractingFromLHS(), IsSingleInstrConstant(), isSlicingProfitable(), isSortedByValueNo(), llvm::ARMBaseInstrInfo::isStoreToStackSlotPostFE(), isSupportedGuardInstruction(), isSupportedType(), isTerminalReg(), isTruncateOf(), isVECTOR_SHUFFLE_SPLATI(), isWeak(), isZeroLengthArray(), iterativelySimplifyCFG(), llvm::LiveRange::join(), LinearizeExprTree(), llvm_getMetadata(), LLVMCopyModuleFlagsMetadata(), LLVMDisasmInstruction(), LLVMGetDebugLocDirectory(), LLVMGetDebugLocFilename(), LLVMGetDebugLocLine(), LLVMGetRelocationTypeName(), llvm::coverage::CoverageMapping::load(), llvm::MipsSEInstrInfo::loadImmediate(), llvm::X86InstrInfo::loadRegFromAddr(), llvm::PPCInstrInfo::loadRegFromStackSlot(), lookupCandidateBaseReg(), llvm::BlockFrequencyInfoImplBase::LoopData::LoopData(), llvm::LegalizerHelper::lower(), LowerBUILD_VECTORAsVariablePermute(), LowerBUILD_VECTORvXi1(), llvm::ARMCallLowering::lowerCall(), llvm::HexagonTargetLowering::LowerCall(), llvm::SystemZTargetLowering::LowerCall(), llvm::NVPTXTargetLowering::LowerCall(), llvm::SparcTargetLowering::LowerCall_32(), llvm::SparcTargetLowering::LowerCall_64(), lowerCallResult(), llvm::HexagonTargetLowering::LowerCallResult(), llvm::SITargetLowering::LowerCallResult(), LowerCallResult(), llvm::FastISel::lowerCallTo(), llvm::TargetLowering::LowerCallTo(), llvm::R600TargetLowering::LowerFormalArguments(), llvm::HexagonTargetLowering::LowerFormalArguments(), llvm::SITargetLowering::LowerFormalArguments(), llvm::SystemZTargetLowering::LowerFormalArguments(), llvm::NVPTXTargetLowering::LowerFormalArguments(), llvm::SparcTargetLowering::LowerFormalArguments_64(), LowerInterruptReturn(), llvm::BPFTargetLowering::LowerOperation(), lowerRegToMasks(), llvm::AMDGPUCallLowering::lowerReturn(), llvm::AArch64CallLowering::lowerReturn(), llvm::MipsCallLowering::lowerReturn(), llvm::HexagonTargetLowering::LowerReturn(), llvm::SITargetLowering::LowerReturn(), llvm::SystemZTargetLowering::LowerReturn(), llvm::NVPTXTargetLowering::LowerReturn(), llvm::SparcTargetLowering::LowerReturn_32(), llvm::SparcTargetLowering::LowerReturn_64(), LowerShift(), lowerShuffleAsBlend(), lowerShuffleWithUndefHalf(), lowerV16I32Shuffle(), lowerV16I8Shuffle(), lowerV8F32Shuffle(), lowerV8I16GeneralSingleInputShuffle(), lowerV8I32Shuffle(), llvm::HexagonTargetLowering::LowerVECTOR_SHUFFLE(), lowerVECTOR_SHUFFLE_ILVEV(), lowerVECTOR_SHUFFLE_ILVL(), lowerVECTOR_SHUFFLE_ILVOD(), lowerVECTOR_SHUFFLE_ILVR(), lowerVECTOR_SHUFFLE_PCKEV(), lowerVECTOR_SHUFFLE_PCKOD(), lowerVECTOR_SHUFFLE_SHF(), LowerVectorAllZeroTest(), llvm::sys::fs::make_absolute(), llvm::makeFollowupLoopID(), llvm::opt::InputArgList::MakeIndex(), makeStatepointExplicit(), makeStatepointExplicitImpl(), llvm::SparseSolver< LatticeKey, LatticeVal, KeyInfo >::MarkBlockExecutable(), MarkBlocksLiveIn(), llvm::FileCheckPattern::match(), matchBinaryPermuteShuffle(), MatchingStackOffset(), llvm::Intrinsic::matchIntrinsicType(), matchPair(), matchShuffleAsByteRotate(), MaybePredicatedInst(), mayLoopAccessLocation(), mayTailCallThisCC(), mayUsePostIncMode(), llvm::MCELFStreamer::MCELFStreamer(), llvm::BitTracker::RegisterCell::meet(), MergeAliasResults(), mergeCleanupPad(), mergeConstants(), llvm::LegalizerHelper::moreElementsVector(), llvm::InjectorIRStrategy::mutate(), llvm::sys::path::native(), llvm::RuntimePointerChecking::needsChecking(), llvm::PHITransAddr::NeedsPHITranslationFromBlock(), needsReferenceType(), llvm::EscapeEnumerator::Next(), llvm::CCState::nextInRegsParam(), llvm::Triple::normalize(), llvm::RegisterBankInfo::OperandsMapper::OperandsMapper(), false::IntervalSorter::operator()(), llvm::FoldingSetNodeID::operator<(), llvm::operator<<(), llvm::raw_ostream::operator<<(), operator<<(), llvm::SmallVectorImpl< std::pair< llvm::RelocationValueRef, llvm::RelocationEntry > >::operator=(), llvm::object::ExportEntry::operator==(), llvm::BitTracker::RegisterCell::operator==(), llvm::FoldingSetNodeID::operator==(), AllocaSlices::partition_iterator::operator==(), llvm::SmallVectorImpl< std::pair< llvm::RelocationValueRef, llvm::RelocationEntry > >::operator==(), llvm::IndexedMap< unsigned, llvm::VirtReg2IndexFunctor >::operator(), llvm::SmallVectorTemplateCommon< T >::operator(), OptimizeAndOrXor(), OptimizeAwayTrappingUsesOfValue(), llvm::ARMBaseInstrInfo::optimizeCompareInstr(), llvm::PPCInstrInfo::optimizeCompareInstr(), llvm::MemorySSA::OptimizeUses::OptimizeUses(), llvm::IntervalMap< SlotIndex, unsigned >::overlaps(), llvm::TargetLowering::parametersInCSRMatch(), llvm::cl::parser< const PassInfo *>::parse(), llvm::MachO::PackedVersion::parse32(), llvm::MachO::PackedVersion::parse64(), llvm::cl::ParseCommandLineOptions(), llvm::cl::ParseEnvironmentOptions(), llvm::parseExternFuncCallArgs(), llvm::MetadataLoader::MetadataLoaderImpl::parseMetadataAttachment(), parseOptionalLinkageAux(), llvm::MCSectionMachO::ParseSectionSpecifier(), Passv64i1ArgInRegs(), llvm::R600TargetLowering::PerformDAGCombine(), llvm::GVN::ValueTable::phiTranslate(), llvm::PHITransAddr::PHITranslateWithInsertion(), placeSplitBlockCarefully(), llvm::SmallVectorTemplateBase< T >::pop_back(), llvm::SmallVectorTemplateBase< T, true >::pop_back(), llvm::MCStreamer::PopSection(), predictValueUseListOrderImpl(), PrepareCall(), previousEqual(), llvm::safestack::StackLayout::print(), llvm::opt::Arg::print(), llvm::MemoryDepChecker::Dependence::print(), llvm::MachineDominatorTree::print(), llvm::LiveIntervals::print(), PrintCFIEscape(), llvm::WebAssemblyInstPrinter::printInst(), PrintLoopInfo(), printMCExpr(), PrintOps(), llvm::cl::PrintOptionValues(), llvm::PPCFrameLowering::processFunctionBeforeFrameFinalized(), llvm::JumpThreadingPass::ProcessThreadableEdges(), profitImm(), PropagateConstantReturn(), PropagateConstantsIntoArguments(), propagateMetadata(), propagateSwiftErrorVRegs(), llvm::SmallVectorTemplateBase< T >::push_back(), llvm::SmallVectorTemplateBase< T, true >::push_back(), PushArgMD(), llvm::SymbolRemappingReader::read(), llvm::sampleprof::SampleProfileReaderText::read(), llvm::BitstreamCursor::ReadBlockInfoBlock(), llvm::msgpack::Document::readFromBlob(), llvm::sampleprof::SampleProfileReaderGCC::readOneFunctionProfile(), llvm::readPGOFuncNameStrings(), readTriple(), readWideAPInt(), llvm::DomTreeUpdater::recalculate(), recognizeIdentityMask(), llvm::AArch64TargetLowering::ReconstructShuffle(), llvm::StackMaps::recordStatepoint(), redirectValuesFromPredecessorsToPhi(), reduceBuildVecToShuffleWithZero(), RefineErrorLoc(), llvm::RuntimeDyldELF::registerEHFrames(), relocationViaAlloca(), rematerializeLiveValues(), llvm::sys::path::remove_dots(), llvm::sys::path::remove_filename(), llvm::AttributeList::removeAttribute(), llvm::AttributeList::removeAttributes(), RemoveDeadAddBetweenLEAAndJT(), removeDuplicateGCPtrs(), removeExternalCFGEdges(), RemoveInstInputs(), llvm::LazyCallGraph::RefSCC::removeInternalRefEdge(), llvm::cl::parser< const PassInfo *>::removeLiteralOption(), removePhis(), removeRedundantBlockingStores(), llvm::Record::removeValue(), llvm::sys::path::replace_extension(), llvm::sys::path::replace_path_prefix(), llvm::SelectionDAG::ReplaceAllUsesOfValuesWith(), llvm::X86InstrInfo::replaceBranchWithTailCall(), llvm::HexagonMCChecker::reportBranchErrors(), reportMayClobberedLoad(), llvm::cl::ResetAllOptionOccurrences(), llvm::SmallVectorImpl< std::pair< llvm::RelocationValueRef, llvm::RelocationEntry > >::resize(), llvm::ARMFrameLowering::ResolveFrameIndexReference(), llvm::RuntimeDyldImpl::resolveRelocationList(), resolveTargetShuffleInputsAndMask(), RestoreSpillList(), llvm::CCState::resultsCompatible(), RetagMask(), llvm::MSP430InstrInfo::reverseBranchCondition(), llvm::WebAssemblyInstrInfo::reverseBranchCondition(), llvm::RISCVInstrInfo::reverseBranchCondition(), llvm::MipsInstrInfo::reverseBranchCondition(), llvm::XCoreInstrInfo::reverseBranchCondition(), llvm::SparcInstrInfo::reverseBranchCondition(), llvm::ARCInstrInfo::reverseBranchCondition(), llvm::AVRInstrInfo::reverseBranchCondition(), llvm::LanaiInstrInfo::reverseBranchCondition(), llvm::SystemZInstrInfo::reverseBranchCondition(), llvm::SIInstrInfo::reverseBranchCondition(), llvm::PPCInstrInfo::reverseBranchCondition(), llvm::X86InstrInfo::reverseBranchCondition(), rotateSign(), llvm::IRCEPass::run(), llvm::LoopSimplifyPass::run(), llvm::InlinerPass::run(), llvm::WholeProgramDevirtPass::run(), llvm::LoopVectorizePass::runImpl(), llvm::runIPSCCP(), llvm::RegisterClassInfo::runOnMachineFunction(), scalarizeBinOpOfBuildVectors(), scalarizeExtractedBinop(), llvm::AMDGPUInstructionSelector::select(), llvm::SelectionDAGISel::SelectCodeCommon(), selectJumpTableArmEncoding(), llvm::FastISel::selectPatchpoint(), llvm::EngineBuilder::selectTarget(), llvm::mca::ResourceManager::setCustomStrategy(), setImmutableRefs(), setLocInfo(), llvm::DominatorTreeBase< BasicBlock, false >::setNewRoot(), llvm::IntervalMapImpl::Path::setSize(), shouldKeepInEntry(), ShrinkLoadReplaceStoreWithStore(), SimplifyAddOperands(), SimplifyBranchOnICmpChain(), llvm::X86TargetLowering::SimplifyDemandedVectorEltsForTargetNode(), simplifyDivRem(), simplifyRelocatesOffABase(), SimplifyShuffleVectorInst(), SimplifySwitchOnSelect(), SimplifyWithOpReplaced(), SinkCommonCodeFromPredecessors(), sinkLastInstruction(), llvm::IndexedMap< unsigned, llvm::VirtReg2IndexFunctor >::size(), llvm::SmallSet< unsigned, 16 >::size(), llvm::LiveRangeEdit::size(), llvm::HexagonShuffler::size(), llvm::opt::ArgList::size(), llvm::SparseSet< unsigned, llvm::VirtReg2IndexFunctor >::size(), llvm::MCInst::size(), llvm::LiveRange::size(), llvm::SparseMultiSet< VReg2SUnit, VirtReg2IndexFunctor >::size(), llvm::LazyCallGraph::SCC::size(), llvm::LazyCallGraph::RefSCC::size(), llvm::IntervalMapImpl::Path::size(), llvm::MDAttachmentMap::size(), llvm::LessRecordRegister::RecordParts::size(), llvm::SmallVectorTemplateCommon< T >::size_in_bytes(), AllocaSlices::SliceBuilder::SliceBuilder(), llvm::InstCombiner::SliceUpIllegalIntegerPHI(), slotForIndex(), SortCallTargets(), SortNonLocalDepInfoCache(), speculatePHIs(), SplitAddRecs(), splitCallSite(), llvm::splitCodeGen(), llvm::DISubprogram::splitFlags(), llvm::DbgValueHistoryMap::startClobber(), llvm::StatepointLoweringState::startNewStatepoint(), llvm::X86InstrInfo::storeRegToAddr(), llvm::PPCInstrInfo::storeRegToStackSlot(), StoreTailCallArgumentsToStackSlot(), llvm::SmallString< 256 >::str(), llvm::raw_svector_ostream::str(), llvm::Regex::sub(), subRangeLiveAt(), llvm::SmallVectorImpl< std::pair< llvm::RelocationValueRef, llvm::RelocationEntry > >::swap(), swapAntiDependences(), llvm::LazyCallGraph::RefSCC::switchInternalEdgeToRef(), llvm::TailDuplicator::tailDuplicateAndUpdate(), llvm::JumpThreadingPass::ThreadEdge(), llvm::Twine::toNullTerminatedStringRef(), llvm::detail::IEEEFloat::toString(), llvm::APInt::toString(), llvm::Twine::toStringRef(), TrackDefUses(), transformToIndexedCompare(), llvm::LoopTraversal::traverse(), llvm::Triple::Triple(), truncateToSize(), tryBuildVectorShuffle(), llvm::mca::RegisterFile::tryEliminateMove(), llvm::tryFoldSPUpdateIntoPushPop(), tryMergeRange(), tryToElideArgumentCopy(), TurnSwitchRangeIntoICmp(), TypeSizeToSizeIndex(), llvm::IntEqClasses::uncompress(), unifyReturnBlockSet(), unpackF64OnRV32DSoftABI(), UnpackFromArgumentSlot(), llvm::UnrollRuntimeLoopRemainder(), unswitchTrivialSwitch(), updateOperand(), updatePhysDepsUpwards(), llvm::UpgradeModuleFlags(), llvm::UpgradeRetainReleaseMarker(), llvm::LoopVectorizeHints::vectorizeAnalysisPassName(), VectorizePTXValueVTs(), llvm::LoopBase< BasicBlock, Loop >::verifyLoop(), llvm::MemorySSA::verifyOrdering(), VerifyVectorTypes(), llvm::sroa::AllocaSliceRewriter::visit(), llvm::InstCombiner::visitAllocaInst(), llvm::InstCombiner::visitAllocSite(), llvm::SelectionDAGBuilder::visitBitTestCase(), VisitGlobalVariableForEmission(), llvm::InstCombiner::visitLandingPadInst(), llvm::InstCombiner::visitShuffleVectorInst(), llvm::InstCombiner::visitUDiv(), visitUDivOperand(), wrapConstantAsMetadata(), llvm::coverage::CoverageFilenamesSectionWriter::write(), llvm::WriteBitcodeToFile(), llvm::WriteIndexToFile(), llvm::MCAssembler::writeSectionData(), llvm::WriteThinLinkBitcodeToFile(), writeTypeIdSummaryRecord(), XFormVExtractWithShuffleIntoLoad(), llvm::opt::Arg::~Arg(), llvm::raw_fd_ostream::~raw_fd_ostream(), and llvm::ValueSymbolTable::~ValueSymbolTable(). Definition at line 40 of file SmallVector.h. 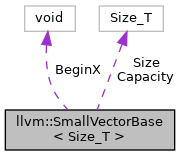 Referenced by llvm::SmallVectorTemplateCommon< T >::begin(), llvm::SmallVectorTemplateBase< T >::grow(), llvm::SmallVectorTemplateCommon< T >::isSmall(), llvm::SmallVectorImpl< std::pair< llvm::RelocationValueRef, llvm::RelocationEntry > >::operator=(), llvm::SmallVectorTemplateCommon< T >::resetToSmall(), and llvm::SmallVectorImpl< std::pair< llvm::RelocationValueRef, llvm::RelocationEntry > >::swap(). Definition at line 41 of file SmallVector.h. Referenced by capacity(), llvm::SmallVectorTemplateBase< T >::grow(), llvm::SmallVectorImpl< std::pair< llvm::RelocationValueRef, llvm::RelocationEntry > >::operator=(), llvm::SmallVectorTemplateCommon< T >::resetToSmall(), and llvm::SmallVectorImpl< std::pair< llvm::RelocationValueRef, llvm::RelocationEntry > >::swap(). Referenced by llvm::SmallVectorImpl< std::pair< llvm::RelocationValueRef, llvm::RelocationEntry > >::clear(), llvm::ComputeASanStackFrameLayout(), empty(), llvm::SmallVectorImpl< std::pair< llvm::RelocationValueRef, llvm::RelocationEntry > >::operator=(), llvm::SmallVectorTemplateCommon< T >::resetToSmall(), set_size(), size(), and llvm::SmallVectorImpl< std::pair< llvm::RelocationValueRef, llvm::RelocationEntry > >::swap().